We finished off the first day of competition with two wins over Team Nunavut and Team Ontario. We also had a chance to take advantage of our Boston Pizza gift certificates that Team Jennifer Jones gave us for boosting their vehicle in North Battleford at the Grand Slam of Curling. Thank you Team Jones! Tomorrow is a another big day with games against Team Alberta and Team BC. Another two game day resulted in an extra end win over Team Alberta and our first loss against Team BC. We are 3-1 after 4 round robin games. Looking forward for a bit of a rest with only one game tomorrow at 7 pm against Newfoundland. Matthew Lysack was our Asham junior star who took took part in warmups with the team. Great to see such a big smile on his face after we presented him with his own Team Kleiter Hardline broom. 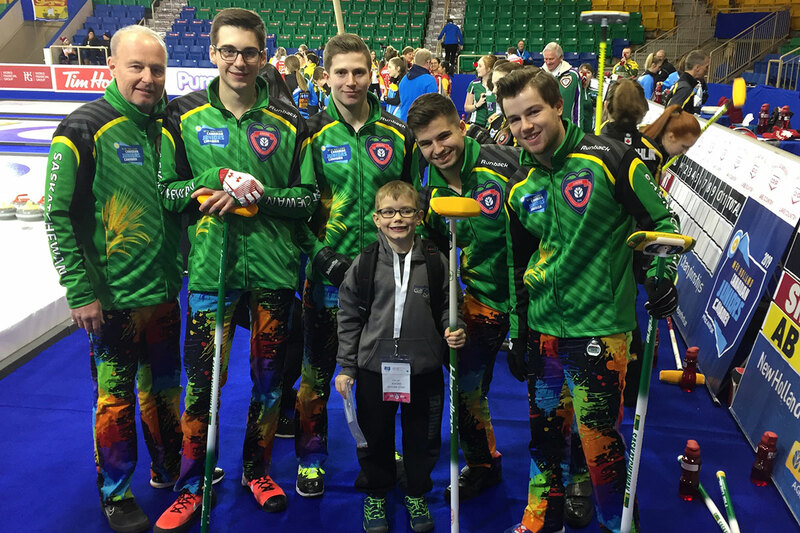 Team Sask Junior Men pose with their Junior Star before one of their games. 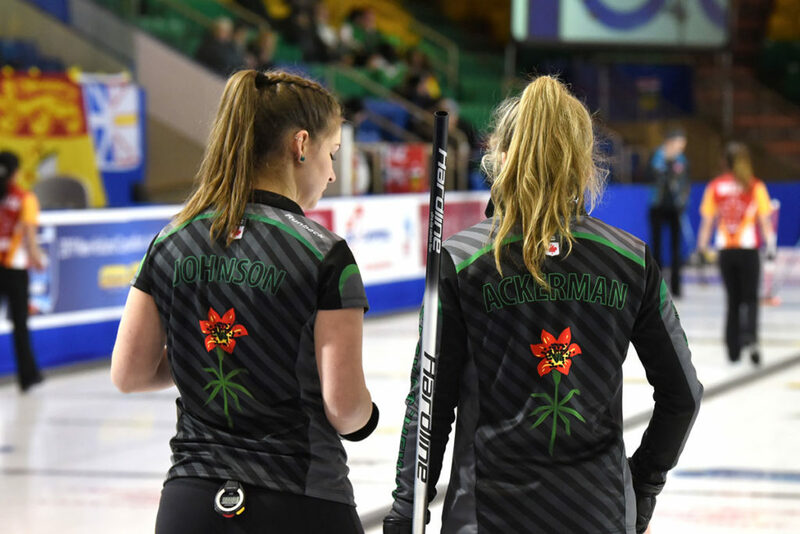 Madison Johnson (left) & Skylar Ackerman (right) during Draw 1 action (Photo Courtesy Curling Canada). 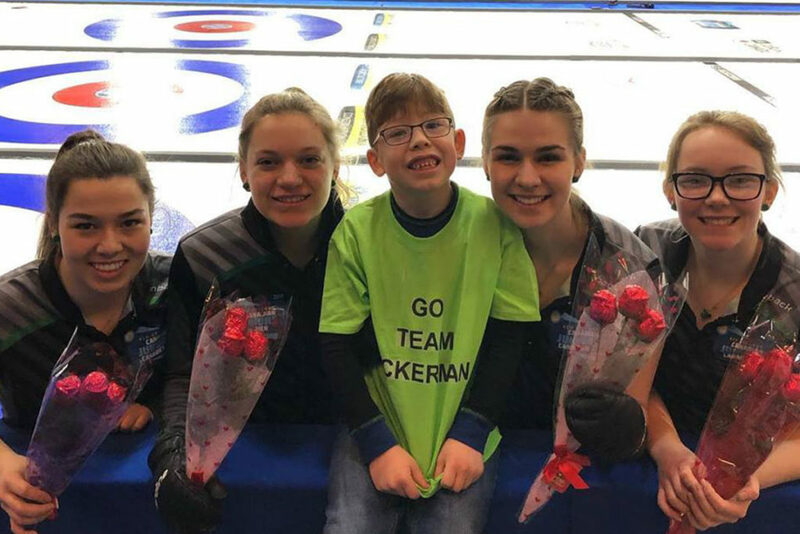 Team Sask Host pose with their Junior Star before one of their games. What a whirlwind the past few weeks and days have been. 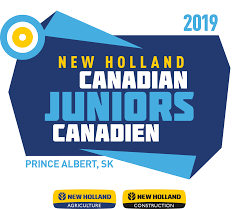 Before heading to the 2019 New Holland Juniors, we had to finish off Semester 1 of high school, so we crammed in our final exams before leaving for Prince Albert. Thank you to all of our teachers and principals for being so supportive. We needed to take a break from writing and need to get our heads wrapped around the fact that we would be heading to a national event- we are so behind on our Team Host Blog, our apologies fans – we have just been busy taking in the experience! We arrived and got our gear, if we may say so, we look pretty sharp. Thanks to @nhagriculture for the great toques. With -40 weather – we needed them. The next morning, we headed to the rink for our practice round and team pictures. The ice is amazing. It was surreal walking out onto the arena ice with the lights and blue carpet. This is the big time. Team meetings and team icebreakers rounded out our first night. Then the wait. We didn’t play until 7:30 pm and Opening Ceremonies wasn’t until 6 pm. Opening Ceremonies was fantastic. The sea of colour from all of the provinces is such a cool sight. Better yet, is being marched in by the Prince Albert Highlanders Pipes and Drums. The great thing about playing in your home province is seeing the sea of GREEN in the stands and hearing the duck calls & train whistles. Once the Opening Ceremonies concluded we rushed over to the curling rink and had our first game against Kaitlyn Jones – Team Nova Scotia. We played a good game but came out with a loss. The 2019 New Holland Juniors has been everything we had hoped for and more. We feel so fortunate to be able to be a part of the experience. We will do our best to try and keep more up-to-date with our blog!